If you like blue, then our Traditional Blue-Vested Lawn Jock is for you! Why does everything have to be red anyway... dare to be different! 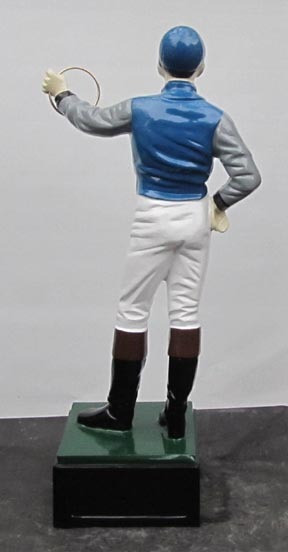 This Lawn Jockey statue is exactly the same as our Red-Vested Jock except his vest is painted a very classy royal blue. Like the Red-Vested Jock, the Traditional Blue Lawn Jockey is virtually maintenance-free and ages gracefully. Just like other yard artwork, just hose him down when you're watering the flowers or set the spinkler to hit him every now and then and he'll look great for years. The Traditional Blue Lawn Jock is fully-painted with blue, white, almond, brown, green, gray, and black oil-based enamels- the same kind of paint used on farm machinery and little red wagons that are used a lot and face the elements. Paint is chip, fade, and UV resistant and will last for many years. The statue itself is made of non-rusting Aluminum so it too will last for generations. A ring is included for the Blue Jock's hand, but these Jocks also work well with our optional oil and solar lanterns(lantern sold separately- CLICK HERE for more information). Gloss Black: Cap brim, eyeballs, cuffs, bottom of boots and bottom of base. Includes removable ring for hand and repainting instructions for future reference. $600 with FREE SHIPPING INCLUDED(to continental U.S. only). Total price: $600. Shipping: FREE.